More than 100 million hours of videos are watched on Facebook every day. On top of that, by 2020, this kind of content is expected to account for more than 80 percent of all consumer internet traffic. However, this potential could be wasted if your video gets buried in the news feed. Let’s assume that you’ve created a high quality animated video but you still don’t get the views that you expected. What could be the problem? While creating quality content is a must, you also need to gear your video toward standing out in a news feed and engaging your audience. In this guide, we are going to address the main issues that could be damaging your rates in social media. Not every approach to video content is suitable for social media. Focus on one key point and develop your video all around it. YouTube’s top creators suggest that you should be able to sum up your video with just one phrase. If you succeed, it will be easy for your audience to explain what is awesome about it when they share it on social media. In fact, shareability is a must in order for your video to go viral. Try asking yourself why your viewer would share your video with friends and family. People watch videos to be entertained, informed, or inspired so keep that in mind while developing your creative strategy. If you don’t hook your audience in the first frame you will lose them. Sad but true, social media usage is ruthlessly fast and furious. Remember that your video will be part of a news feed and users will scroll and watch it between their friends’ pictures. Thanks to the auto-play feature, the user will see the first few seconds of the video but remember that according to Facebook stats, a “video view” is defined as a view of at least three seconds long. In other words, if the user just keeps scrolling, that view won’t count for your Facebook performance. All that being said, the good news is that 65% of people who watch the first three seconds of a Facebook video will watch it for at least 10 seconds, and 45 percent will watch for 30 seconds. Good to hear! Bill Carmody, founder and CEO of Trepoint, recommends a different length for each platform: 30 seconds to one minute for Instagram and Twitter, one minute for Facebook and under five minutes for Youtube. The video length will also depend on the type of video you create. Besides this difference in length, be aware that each social media network has its own specs for images and videos so take a look at this guide. Don’t waste your audience’s time, go straight to the point and state the purpose of your video clearly. Watch this great example of what the best explainer video style for your company is. You can see the customized thumbnail to capture people’s attention from the first second. If you don't choose a video thumbnail on Facebook, the first frame of your video will appear as the preview until the video auto-plays or is clicked-to-play. If you need help with uploading a new thumbnail check out this Facebook guide. What does natively mean? Just upload your video to each social media network. Don’t do it in a video platform like Youtube and then share it as a link on Facebook. Apart from the number of shares and likes, Facebook’s Video ranking considers whether someone has watched a video and for how long they watched it but it can only do this when it is a native video. That will give you a head-start over other content in the news feed. 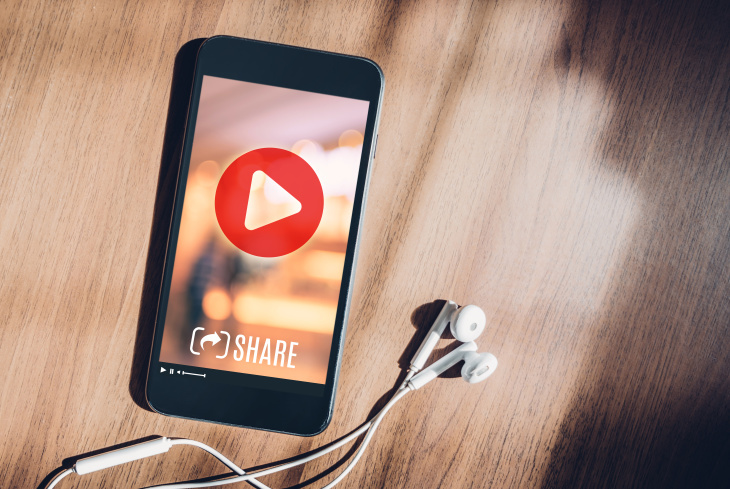 In fact, Quintly found that Facebook native videos had on average a 477 percent higher share rate compared to YouTube videos. As we said before, given that each social media network is different you should leverage all their features to boost your view rate. For example, Facebook allows you to write up to 63.206 characters (but it will cut them to show only 400 in the news feed) while Twitter only allows 280 characters. On Facebook, you can upload an .srt file or you can take advantage of the automatically generated captions. An impactful video should drive concrete marketing results such as more traffic to your website, your client´s contact information or more sales. Yet, sometimes we forgot the good and old call-to-action or CTA. It is very important to guide your prospective customer to do the right action after they’ve watched your video. In order to do that, you can add a link to your website on your copy post or a text overlay at the end of your video to remind them what to do next. Take a look at this Facebook video created by Adidas that works like a trailer for a longer piece. The CTA encourages the viewer to see the full video on Youtube. Preferred Audience uses interest tags to help prioritize Page posts in the News Feed for each unique viewer based on the topics that are most likely to engage them. For example sports, beauty or food. Audience restriction limits the visibility of your video to specific demographics like gender, age, location and language. According to Keap, 71 percent of small businesses plan to use social media content to attract new customers in 2018. With video being a top priority nowadays, 73% of marketers plan on increasing their use of videos. Don’t fall behind! Try to come up with a creative breakout idea that will engage your viewers. Remember to entertain, inform or inspire. Keep your audience in mind e and try to adapt your original idea to fit their length expectations for each social media network. Optimize your copy post and thumbnail to make your video stand out in the news feed. Leverage social media’s features to reach your audience. If you want to learn from the best, Tubular analyzed the top Facebook video publishers and identified the main trends. Can your brand’s video fit in with any of them?